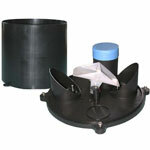 The 260-WS-32 Rain Gauge is a tipping bucket rain gauge constructed of tough, UV resistant plastic. Tower mounting arm and 60' of cable is included. The 260-WS-32RG Rain Gauge is a tipping bucket rain gauge designed to meet the guidelines of the World Meteorological Organization. Rain enters the collector cone, passes through a debris-filtering screen, and collects in one chamber of the tipping bucket. The bucket tips when it has collected an amount of water equal to the increment in which the collector measures (0.01" or .2mm). As the bucket tips, it causes a switch closure and brings the second tipping bucket chamber into position. The rain water drains out through the screened drains in the base of the collector. The body and base of the collector are constructed of tough, UV resistant plastic. The tipping bucket pivots on bearings that minimize friction and wear. Stainless steel adjustment screws under each chamber of the tipping bucket allow you to fine-tune the calibration. Mounting holes are pre-drilled in the base and a built-in leveling trough aids in installation.